Knee implant is the procedure of either totally or partially replacing a part of the knee that is damaged, in order to improve it’s functioning to a normal, efficient, undamaged knee. It is replaced by implants made of metal alloys, ceramic material, or strong plastic parts. The knee implants market is emerging in nature and is experiencing a phase of technological advancements and new product development due to increased demand. The manufacturing companies are indulging into aggressive marketing activities in order to increase their market share and grow awareness among people. Globally, increasing number of old-age population and rising awareness about benefits of knee implant surgeries are the prime growth drivers of knee implants market. However, high cost of knee implants surgeries is the key restraint for knee implants market. The major opportunity of the growth for the knee implants market is the technological advancements in procedures such as minimal invasive surgery and better implant materials. However, growing awareness of non-surgical treatment methods such as exercises, weight loss, walking aids and post-surgery complication issues are challenging the knee implants market growth. This report identifies the global Knee Implants Market size in for the year 2014-2016, and forecast of the same for year 2021. 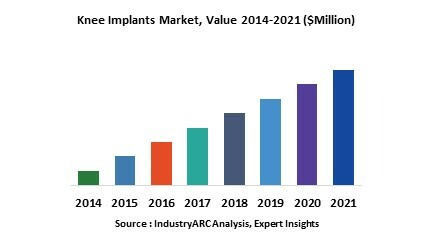 It also highlights the potential growth opportunities in the coming years, while also reviewing the market drivers, restraints, growth indicators, challenges, market dynamics, competitive landscape, and other key aspects with respect to Knee Implants Market. Geographically, Asia Pacific dominated global Knee Implants Market, and is projected to have fastest growth, followed by North America, Europe and Rest of the World (RoW).